Like most of you, I spend an excessive amount of time watching YouTube videos. Some of these video clips are funny, while others are unsettling. Recently I saw something on YouTube I might have found quite amusing if it had not been so unsettling. It featured our prophet, Thomas S. Monson, participating in a ribbon cutting ceremony for a giant new shopping center in Salt Lake City. At a predetermined cue, as the ribbon was cut, all the dignitaries on hand, including our revered Prophet, Seer, and Revelator, chanted in unison, "One, two, three...LET'S GO SHOPPING!" In his defense, President Monson seems less than enthusiastic with his part in this stunt. As you can see in this video at about the 18 second mark, his mouth is moving but he is barely audible compared to some of the others. But then, he isn't miked, so it's hard to tell. At any rate, it's clear that this part of the ceremony was planned in advance, and Monson played his part the best he could. It's worth noting that members of The Church of Jesus Christ of Latter-day Saints consider Thomas Monson to be God's one true spokesman on the earth in these latter days, the spiritual heir of all the great prophets who came before. That list would include not only latter-day prophets such as Joseph Smith, but also the great biblical prophets such as Moses, Ezekial, and Isaiah; and the mighty prophets of the Book of Mormon such as Nephi, Alma, and Abinadi. Like our founding prophet Joseph Smith, these ancient prophets understood their responsibility was "to say nothing but repentance unto this generation." But I guess that was for those earlier generations. Different prophets for different times. Apparently the role of the prophet of God today is to encourage us to grab our wallets and purses and head over to Macy's for some silks and scarlets and fine-twined linen. And don't forget to do some banking. Two years ago Monson showed up in Provo to dedicate a newly opened branch of Zion's Bank. And yes, you read that right. The prophet of God dedicated a bank. You know, "dedicated" as in praying over it -like when he dedicates a temple to the Lord. 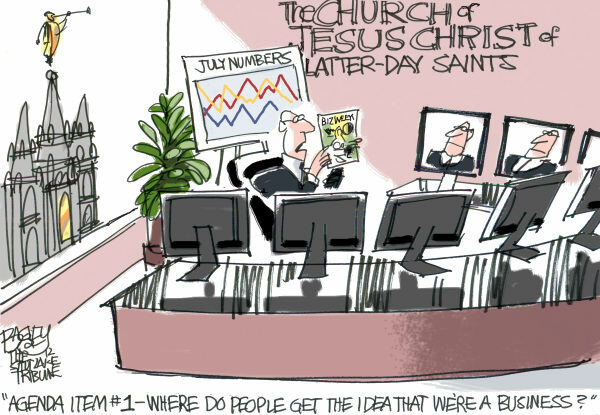 Church spokesmen claim the LDS Church no longer holds a controlling financial interest in Zion's Bank, so that's a relief. Last year Zion's Bancorporation was implicated in the laundering of billions in drug money, and before that was the recipient of 1.4 Billion in taxpayer bailouts. Being associated with such an unsavory institution could sully the Church's good name. Best to divest the Church of it's controlling ownership of that bank and instead just send the prophet of God over to handle the dedicatory prayer. The Church's association with the City Creek mall is a very big deal and a major topic of conversation all along the Wasatch front, but I have a friend who is a bishop in a southern state who tells me his congregation has heard absolutely nothing about it. So for those members in distant climes who are out of the loop on this, allow me to clue you in. City Creek Center is a massive outdoor mall smack in the middle of downtown Salt Lake City, and as malls go, this one is a doozy. It's more of a cross between an outdoor shopping mall and a very large park, with waterfalls, fountains, and a creek running through the middle stocked with trout. Among its 100 stores are Macy's, Nordstrom's, Tiffany's, Brooks Brothers, and countless other high-dollar boutiques targeted at society's upper crust. There is no underestimating the beauty of this mall. As man-made wonders go, City Creek Center is as impressive a sight as you're likely to find this side of Las Vegas. There is a reason President Monson felt it important to place his imprimatur on this expensive venture. The whole thing was financed with investments originally derived from Church tithing funds, and there is sure to be some anxiety about whether, in these slow economic times, any of those dollars will ever be recouped. So far the City Creek project has drained Church coffers of an estimated 1.5 Billion dollars, and when the additional condos and high rise buildings are completed, costs are expected to reach or exceed $5 Billion. Personally, I'm betting costs will exceed that. This is a veritable downtown neighborhood being built from the ground up, and it won't come cheap. If I sound cynical, it's because I was raised to believe that Jesus Christ is the head of this Church and that he makes all the important decisions directing it. But I am inclined to believe the Lord was not consulted on this one. Why? Because development on the City Creek project (and a $100 Million hotel in Hawaii) began just before America fell into its greatest depression in eighty years. Had the prophet inquired of the Lord on the propriety of committing sacred funds into a shopping mall intended to cater to the upper middle class, the Almighty might have clued him in to the fact that most of that target demographic was about to have half their assets wiped out in the stock and housing markets. When the upper crusties can't afford to shop at Brooks Brothers and Tiffany's, no one else can either. Not only did our prophet, seer, and revelator fail to warn the people about the economic calamity that was about to befall the nation, he himself appeared unaware of its imminent arrival, blithely pouring Church funds into an expensive debacle that could only expect to succeed in an upwardly rising economic environment. If one of the jobs of a prophet is to act as a watchman on the wall, Thomas Spencer Monson had fallen asleep at the parapet. You hicks in the hinterlands weren't the only members of the church caught unaware about the corporate Church's involvement in this project. Many of those living in the shadow of temple square were themselves uninformed about who was fronting the money for it, almost up until the grand opening. No members heard about it through proper Church channels as they should have. It was never announced in general conference. Everyday ordinary run-of-the-mill latter-day Saints like you and me had to wait and read about it in the paper. And now, thanks to this cover story in Bloomberg BusinessWeek, the whole world knows that Mormons are the only ones dumb enough to pour their money into a giant shopping mall at a time when everyone else is getting out. We couldn't be more proud. Whether the City Creek project was a good idea or a bad one is almost beside the point. What should be of concern to us is that we mere members of the church are constantly and deliberately kept in the dark about the corporate wing's financial dealings, even though as members we are essentially the holders for value. This kind of secrecy violates Church doctrine and goes against more than a century of long-standing tradition. For the first 128 years of this Church's formal existence, it was an essential part of April conference for the leaders of the Church to report it's financial dealings in full to the general membership. This was usually among the first matters of business during the Saturday morning session. From the time of Joseph Smith on, it was understood that the members who provided the tithes were to be shown how their sacred tithing dollars had been disbursed so they could voice their consent. The leaders understood they had a sacred fiduciary trust and a responsibility to inform the members of a) how much money was collected in tithing, and b) how that money was being spent from one year to the next. I have a collection of Conference Reports going back several decades, so I pulled a random sample to see what one of these financial reports looked like back in the day. I chose the 1951 conference report as that was the year of my birth, and to see how by the time I had reached the age of baptism, this important practice had been abruptly discontinued. This 1951 report, which covered expenditures for the previous year, was read in full by Second Counselor J. Reuben Clark, under the direction of President David O. McKay. You can see that report here. It begins on page 11 and continues to page 18 where the Church Auditing Committee signed off on it. I hope you'll at least click on the link and take a look. I don't expect you to read the entire report, but just by paging through it for a moment or two you will see how seriously Church leadership once took its responsibility of informing the membership on how their money was being used. At the end of 1950, as Church auditors reported, "The Church is in strong financial position and free from debt." In subsequent years things just kept getting better, and by 1957, the Church had $70 million in reserves sitting in Zion's First National Bank. But the year after that, it all went south. Due to a poorly thought-out and unrestrained program of real estate acquisition, the Church suddenly found itself cash poor and $8 million in debt. Out of a sense of embarrassment, the leaders decided, for the first time in the history of the Church, not to include a financial report to the members at the next conference session. Deficits more than doubled the year after that, until by 1963 the Church was on the brink of bankruptcy. There has never been another financial report filed since. After Eldon Tanner took over as Church Chief Financial Officer in 1963 and eventually brought the Church solvent, there was another reason to be embarrassed about the Church's finances. LDS, Inc. was becoming very, very rich, and not through investments normally considered appropriate for a church. It's one thing for a church to invest its member's surplus tithes in ranches, farms, and orchards, since those kinds of investments can produce sustenance for the needy, which after all is the primary purpose of tithing in the first place. But Tanner was investing Church money into banks, insurance companies, public utilities, commercial real estate, money market funds, treasury bills, and oil companies like Standard Oil, Exxon, and Phillips Petroleum. He bought a million dollars worth of stock in the Los Angeles Times, and four years later it was worth four million. Eventually, under Tanner's guidance, the church found itself not just out of debt, but richer than it had ever been before. Billions of dollars richer. And that was the sticky wicket. How do you report to the membership that the method their leaders chose to get the Church out of harm's way was by investing it in Babylon? Answer: you decide it's best to say nothing at all. I am not suggesting that there are no enterprises to which surplus tithes can not be properly invested. In my opinion, a Church should strive to control its own press and publishing, along with its own newspapers and other mass communication organs to aid in promulgating its message. The University of Deseret was founded in 1850 using tithing funds with the purpose of providing Mormons with a chance for a higher education; and ten years later Brigham Young Academy was established in Provo. Such ventures strike me as consistent with the building of a Zion society where all contribute voluntarily toward the betterment of one another. The Church, [President Smith] said, had always tried to "help establish home industries and to aid in setting certain business enterprises on their feet," in order to provide employment and "to develop the material resources to the country, that the people and the land may prosper." Those purposes accomplished, the Church had generally withdrawn, "holding in most cases only a very little financial interest in the enterprises." In his view, spiritual and temporal salvation complemented each other, and the Church promoted both. Such former practices where the Church could be found carefully nurturing incipient businesses for the benefit of individuals within the Mormon community is a far cry from the modern practice. Today, the institutional Church directs its investments toward building an economic empire for the benefit of the institution itself, while the members are kept entirely out of the loop. We are all familiar with Lord Acton's famous maxim, "power corrupts, and absolute power corrupts absolutely." I am not about to accuse Church leadership of either holding absolute power, or of being absolutely corrupt. But let's consider just the first half of that couplet, the one that says "power corrupts." This is a well known tenet of LDS doctrine. The possibility that priesthood leaders are capable of coming to see themselves as somehow superior in knowledge and ability over those they are called to serve, and must ofttimes be held in check, is codified in Doctrine & Covenants section 121, verse 39. And those who insist we should completely trust our leaders to always do the right thing and never do wrong should try to explain why section 107 provides the method by which the president of the Church can be removed for transgression. Humans are prone to making errors, sometimes serious ones. No one is infallible. But drastic measures are not necessary, in my opinion, in order to rein our leaders back in. All we need do is go back to doing things the way the Lord set it up, when he commanded that "all things shall be done by common consent in the church" (D&C 26). We deserve to get away from the dichotomized Church we have somehow turned into, where certain members have attained a status akin to royalty, and those below them in rank are expected not to question their actions or decrees. As members of the Church of Jesus Christ of Latter-day Saints it is our desire to faithfully fulfill our obligation to our church by at least annually giving our “voice and Common Consent” as to the allocation of the funds that have been and are currently being donated by us to our Church. We believe as President Hinckley stated that the financial information of our church “belongs to those that made the contribution”. For most of our history our church provided full disclosure of its funds. Even in times of financial difficulties members could share in the joy of knowing that good works were being accomplished with their collective donations. We have confidence that a full annual financial disclosure will vindicate the virtue and integrity of our church’s financial affairs that are consistent with the principles taught by our Lord. Such open transparency will also dispel all mystery that often leads to unverifiable speculation both without and within our church: “And He doeth nothing, save it be plain.” (2 Ne. 26:33). We seek complete transparency in all our financial affairs by following the Lord’s counsel that monies placed into His treasury shall “not be used, or taken out of the treasury, only by voice and common consent” (Doctrine and Covenants 104:71). Therefore, we the undersigned members formally request that the Church of Jesus Christ of Latter-day Saints once again publish a full annual financial report that provides sufficient details so that we as members can once again give our “voice and Common Consent” as to the allocation of monies expended by our Church. No sooner had this petition begun to circulate, than there began to be voices of opposition against it, most notably this plea entitled, "Please Don't Question Church Leadership On Finances." To which I respond, "Why not? Aren't we supposed to?" You will notice from a reading of that piece and the comments that agree with it, all manner of opinions are expressed as to why members of the church should close their eyes and not be concerned with how their tithing money is being used. What is missing from these screeds however, is any scriptural justification for those positions. As I brought out in my previous entry, you can find no end to opinions in the church as to what some believe "Mormonism" is meant to entail, but many fail to provide scriptural citations to support those positions. Sadly, there are many within the church who care little about what their religion actually teaches. What matters is what they think it teaches. Prominent among such beliefs is that once you pay your tithing, that money is the Lord's and no longer your concern. Yes, the money does belong to the Lord, but you didn't hand it over to the Lord himself, you placed it into the hands of mortal men. Men, even priesthood leaders, are quite capable of taking the Lord's money and spending it foolishly. It's a pretty safe bet that you can trust in the Lord, but the Lord himself commands us to "trust not in the arm of flesh." When you give your money over to be used for the Lord's purposes, the Lord does not expect you to be ambivalent about what becomes of it. But not everyone agrees. Here is an excerpt from the blog of one Nathan Shumate, whose slug line aptly reads, "I make things up." "My attachment to those funds, and any sense of oversight regarding their use, ends the moment I hand them to the Bishop. As far as I’m concerned, the Bishop could take all the tithing money out behind the meetinghouse every Sunday afternoon and light a fire with them. What is important for my spiritual welfare is that I make a sacrifice, that I couch my belief in active, inconvenient terms. I do not “buy in” to the Church as an earthly organization; I “buy in” to the Lord with my faithfulness, obedience, and sacrifice." In other words, God doesn't need your money; he just wants to test you. Allow me to respond by relating a true story involving my wife. Some years ago when her health was better than it is now, Connie was visiting friends in Salt Lake City around Christmas time. I have written elsewhere about how Connie is spiritually intuitive. Since like attracts like, these friends of hers were similarly attuned. This was an exceptional group of people, yet really no different from the kind of folks we all should hope to aspire to. Anyway, these four friends decided they would go out and acquire enough food to provide a needy family with all the fixings to make up a traditional Christmas dinner, then simply ask God where he wanted it delivered. So they pooled their money and went to a grocery store where they bought a ready-cooked turkey with stuffing, along with mashed potatoes, rolls, butter, gravy, a greenbean casserole, jello, a big bowl of ambrosia, a pumpkin pie and an apple pie -everything they could think of to make up a complete Norman Rockwell style holiday feast, right down to the cranberry sauce. Then they hauled those bags of food out to the car, said a prayer, and just started driving around a nearby neighborhood. Before long, one of the women in the group said, "Here. Stop the car. Right here." They parked in front of a rundown apartment building and carried their bags of groceries up to one of the doors. A woman answered, with three children standing somewhat apprehensively behind her. Connie said, "Hi. Can you use some dinner?" After a moment of stunned silence while Connie and her friends excitedly showed the woman what they had brought in the sacks, the woman broke down and started weeping with gratitude. She invited them in to meet her children and told how she was down to no money, with not so much as a rotten old carrot left in the fridge. She had asked her children to stand in a circle with her to hold hands and pray that somehow God would find a way to help them get some supper that night. They were in the middle of that prayer when the doorbell rang and the food arrived. When Connie came home and told me of her experience, I gathered some important lessons from it that had not occurred to me before. Chief among these lessons was the realization that God is not all-powerful. By whatever name or set of reasoning you want to give it, be it The Laws of God or The Laws of Heaven, there are some things even God is restricted from doing. For instance, God cannot come down in person and leave a box of groceries on someone's porch. God depends on us to carry out his will. We are his hands, his eyes, his ears. We are His emissaries of goodwill. All of us are expected to be God's angels on earth, ministering to each other in kindness. When God hears a young mother's prayer, the way he acts on that prayer is by inspiring others to perform in his stead. That's what it means to emulate Christ; we do the things Jesus would do himself if he were here to do them. So here is something to ponder: what do you suppose would have become of that young mother and her children if Connie and her friends had ignored the promptings of the spirit that inspired them to go out and gather food to take to a stranger? 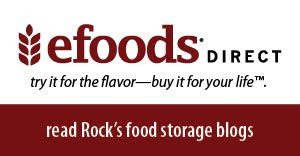 The answer is simple: that young family would have gone hungry. It happens every day all over the world; people pray for help and help never comes. I don't think this is because God ignores their prayers. I think it's because those who are in positions to lend a hand often ignore God when he is whispering in their ears. We distort the gospel of Christ when we presume the law of tithing exists as a test of our willingness to be blindly obedient. We are commanded to give of our sustenance because those tithes and offerings are actually needed to sustain the lives of real, living human beings. How dare anyone blithely suggest that it doesn't really matter if those urgently needed funds are taken outside and set on fire! What a mockery that makes of the purposes of God. The Lord not only expects you to tithe, but also to be mindful that those tithes are put to good use. Yes, God actually does need your money. He is not playing games with you or testing your loyalty or getting a kick out of watching you sacrifice. The law of tithing is a law for a reason. It is important. It is necessary. It is needed. It is not a trifle. 1. The Church made sure no tithing funds were used for the building of the mall. The funds for City Creek came from Church investments. This seems a bit of a stretch. All funds at the Church's disposal are originally derived from tithing. The way it used to work is that tithing funds were collected, then immediately disbursed to where they were needed. The income kept pace with the outgo, as President Kimball once told a reporter. But what happens these days is that a certain amount of tithing is immediately parked into investments where it sits for three years earning interest. A billion dollars invested in a money market account can yield millions in interest. It is these millions that have then been reinvested in such things as real estate holdings. In any ordinary case, I would say this is wise stewardship of one's money. But has the Lord ever instructed his people to set aside tithing to be invested in gentile pursuits? Not according to history. We Mormons tend to interpret Malachi chapter 3 as chastising the people for being slow in paying their tithing to the Church. But a reading of the Book of Malachi makes clear that the The Lord was rebuking not the people, but the priests. Old Testament scholars report that the ancient Jews by and large tended to be diligent tithe payers, but the Jewish priests who collected those tithes sometimes had a tendency to withhold a portion of those tithes to put to other uses. I can understand this proclivity. I don't think the Levite priests were trying to hide or embezzle the tithes, any more than I think our modern Church fathers are motivated by evil intent. I think those Jewish priests may have just been nervous about having all that responsibility on their hands. When you are charged with overseeing the Lord's treasure, it's easy assume you have a sacred obligation to protect those funds to the utmost of your ability, and even to invest them so they can be multiplied. The problem is, trying to do things your way instead of God's way often results in an imbalance of priorities, as has happened on numerous times even here in The Lord's True Church. In the old testament book of Malachi, God was telling the priests to stop relying on their own wisdom as to how the tithing should be used, and "bring ye all the tithes into the storehouse" where they belonged. Those tithes are intended, first and foremost, to provide "meat in mine house" for those who need it. If you priests are concerned about running out of funds, the Lord is saying, try doing it my way for a change and see "if I will not open the windows of heaven and pour you out a blessing that there shall not be room enough to receive it." Do things my way, the Lord says, and you won't have to worry about there being any shortages. 2. The area around temple square was deteriorating economically; City Creek Mall is needed to revitalize downtown Salt Lake City. Downtowns are deteriorating all across the country, but is it the role of the Church to rebuild them? If there is a valid reason to invest in a troubled area, business developers would be investing private funds. This has happened in New York's Soho and Greenwich village, along with San Francisco's Haight Ashbury district just to name a few examples. These neighborhoods were once decaying and are now vibrant. If Downtown Salt Lake is worth saving, there are more appropriate ways to rescue it than having the Church step in as savior of the city. There was a reason stores and shops in downtown Salt lake were going out of business. A lot of people in the area could no longer afford to support them as in the past. The multi-story Crossroads Mall was demolished to make way for the City Creek. So was the ZCMI Center. But will the mere act of replacing old stores with new ones guarantee that people will start spending again? You can build an expensive new mausoleum on top of an old cemetery, but all you really end up with is a shiny new graveyard. In the video clip posted above, I notice large crowds of visitors, but very few are carrying shopping bags. We see a woman with her daughter picking up a shoe from a display, looking at it, then putting it back. A lot of folks have turned out for this grand opening, and they seem to be having a pleasant enough time strolling the walkways. But very few of these people appear to be buying anything. If City Creek Center is going to revitalize downtown, a lot of people are going to have to start spending a lot of money there, and quick. Otherwise those shops will be leaving, too. The number of Very Important Persons participating in the ribbon cutting at City Creek Center was impressive by any standard. How often do you see both the mayor and the governor of a state turn out for a mall opening? Clearly this was a very big deal. In addition to President Monson, both his counselors, Henry Eyring and Dieter Uchdorff, were on hand. That's the entire First Presidency of the Church, taking precious time away from their urgent ecclesiastical duties to take part in the kind of stunt normally handled by some guy from the local chamber of commerce and the first runner-up to Miss Provo. Watching the man we latter-day Saints sustain as a living prophet reduced to the role of a cheap mall huckster is disconcerting, to say the least. I try to imagine Abinadi standing there in Monson's place as the countdown begins: "one, two, three...Let's Go Shopping!" and the picture just won't form. As a church and as a people, this was not our finest moment. The enthusiasm with which Church representatives touted this project barely disguised the sense of desperation evident as the grand opening date approached. It's been reported that the entire project was originally budgeted at $500 million, but quickly became a money pit that is swallowing up billions of dollars at a time when regular tithing receipts have slowed considerably. Many Mormons who previously paid their tithing faithfully each month now find themselves out of work. 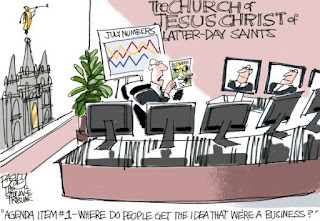 With the decline of all those jobs also comes a decline in tithing receipts for the Church. That means a lot less money to cover the day-to-day expenses of operating the Church, along with less money to care for our poor at a time when it is needed more than ever. This is an unanticipated squeeze. At the same time Church funds were endlessly funneled into a glitzy shopping center, bishops were being advised to persuade needy members to exhaust other available resources before relying on Church assistance. It looks to me like there is a lot riding on this mall. I think the Brethren bet the farm on this one, and I'm guessing there's a lot of sweating going on in the corporate boardroom at the Church office building. You can almost smell the desperation: This thing has GOT to work out. It just HAS to. But I don't see how it can. Anyone who thinks the Church can ever make good on this "investment" by collecting rents from mall merchants simply has no idea how much a billion dollars actually is, let alone five billion. The Church will never earn that money back. It's gone. Then again, I may be entirely out of line here. It's quite possible that God revealed to the prophet His desire to see a multi-billion dollar mall constructed with Church funds for the sole reason that He was tired of looking down and seeing what an eyesore Salt Lake City had become. If any such revelation is produced, I will humbly stand corrected and forevermore keep silent on this matter. But if there was not a revelation, it is entirely appropriate for faithful members of the Church of Jesus Christ to expect an explanation as to why those entrusted with the Lord's money made such a foolishly extravagant move without first obtaining authorization from above. Related Post: City Creek: How Did We Come To This?